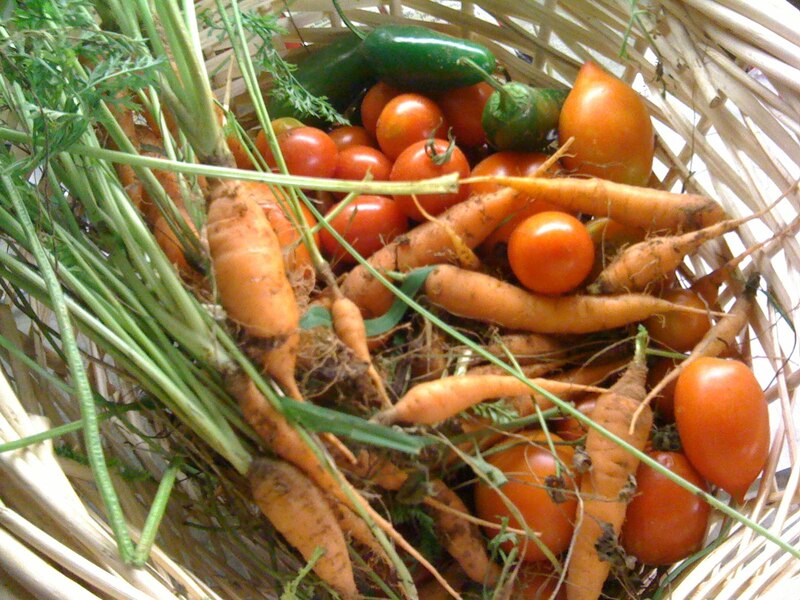 Summer months are coming to an end and most of our garden has peaked. 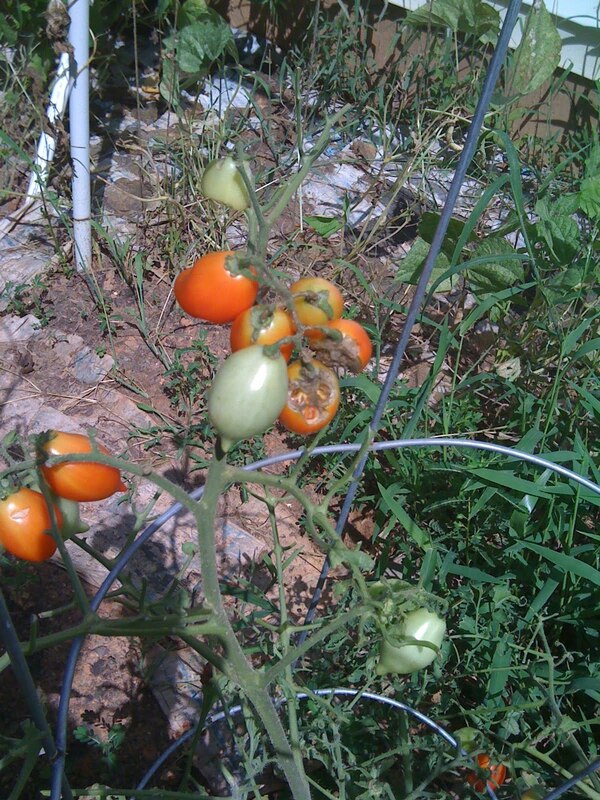 The tomatoes and jalapeno plant are on the wain. 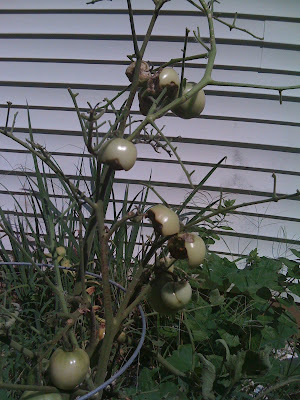 We have evidence of a Tomato Horn Worm, but I cannot find the thing to save my life. He's been eating on my green and slightly ripened red tomatoes and eaten all the leaves off the top of the plants. The green beans were slow to start and then we got a ton of rain and the beans got huge overnight and are not very edible. We are going to save the seeds to use in next year's garden. The deer found our carrots so we decided to pull them up early before the deer feasted on the rest of them. Some are about 5" long, but most are on the smaller side. On the other hand, our cucumbers were not doing very good in the baby pool. After reading the comment from Jamie at An Oregon Cottage, I decided to give them more water. 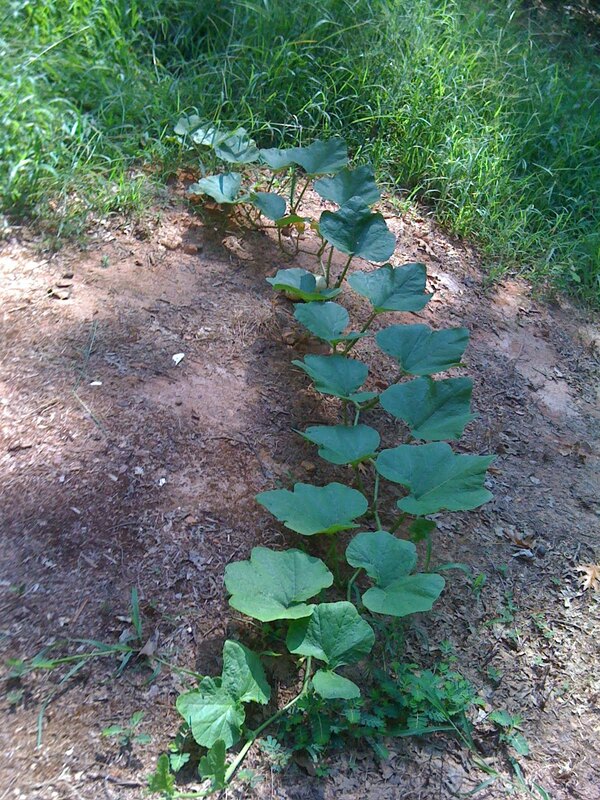 Then we got alot of rain and the cucumbers took off! I'm so excited to say we have lots of baby cukes growing! Thanks Jamie! Same goes for the butternut squash. I'm not exaggerating when I tell you a runner is about 20' long! There are several squash growing and I'm looking forward to harvesting them in a few weeks. This has been a pretty successful garden for me this year. The kids and I have really enjoyed eating the fruits of our labor. Planting the vegetables from seeds has been so rewarding. Haylei and Hunter love being in the garden and seeing all the ladybugs, spiders and worms. While we didn't have enough vegetables this year to preserve, I have big plans for next year's garden and have been contemplating a winter garden of collards, kale and cabbage. I'll have to do more research as I've never done a winter garden. My dad usually plants collards, so I'll ask him what he thinks. 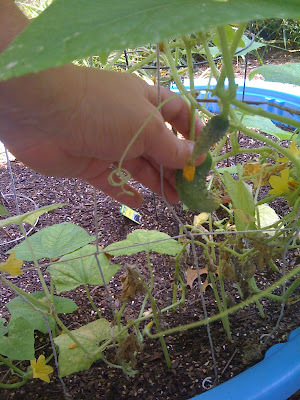 Be sure to visit Tuesday Garden Party to see what others are growing. 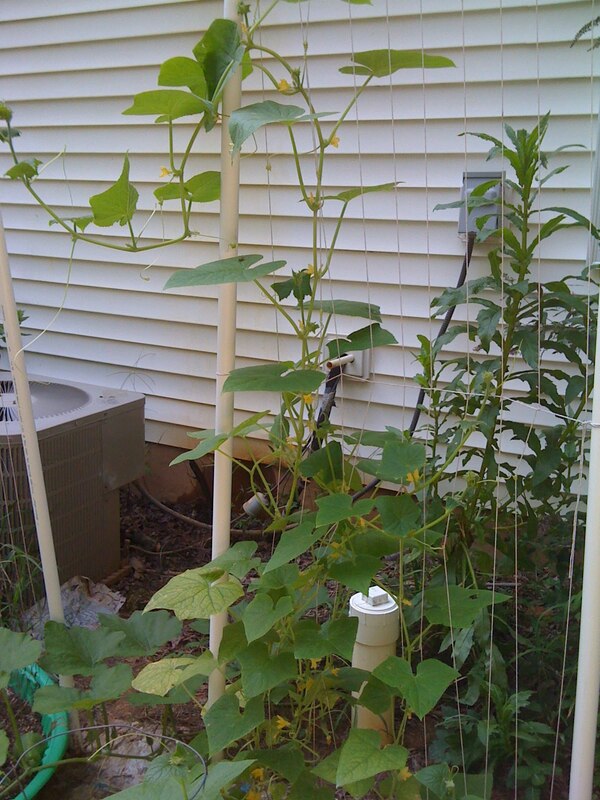 It's so fun to see what stage the vegetables are growing in different climates. Those tomatoes make me so sad! You have had a productive season indeed! Thanks for the info about the tomato worm. I'll take a look for him (grr...) and hopefully rid our garden of him. We're also thinking of a winter garden. I'll stay tuned to see how you do! Thanks for the comment. Those are some sad tomatoes! All I have is green ones here. I've sent your recipe for Mexican Chocolate Cupcakes with Mango Buttercream to my daughter, the baker, hopefully she will try these. Can not wait! I have my best luck finding tomato horn worms at dusk or in the early morning. I systematically go over every stem and every leaf - checking the underside where they like to hide. Once I find them - I toss them to the ground and step on them - laughing as their green guts squish out. Pesky varmints! Hope you catch them! Looks like you have had a good year vegetable gardening. Mine is mediocre at best. the heat hasn't helped me this year. Well, since you are able to start earlier than us, I guess it makes sense that you're starting to wane. I've got some broccoli, cauliflower, kale, chard, and turnips for fall and winter. I try every year, but it's always a crap-shoot. I figure anything I get is bonus! Keep us updated if you grow anything. I used to love having a huge garden when the kids were small. 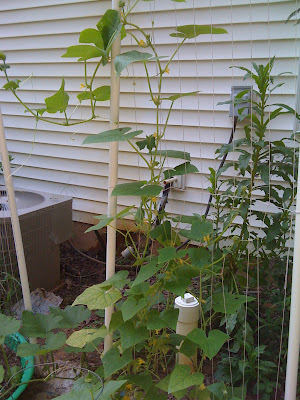 My husband would make tepees for the peas and green beans and the boys could go inside. They made roads for the cars through the garden trails and would sit and munch fresh veggues while playing outside. You are making wonderful memories along with the food the garden grows...I still ahve a small garden and now that my sons are adults they planted a garden of their own!